Shopify's POS can swipe credit cards and connect to merchants' online stores. Merchants using Shopify Inc. to power their storefronts are now getting two big changes to how they run transactions – they can now directly charge online customers through Shopify instead of using a third-party payment system, like PayPal, and they can also use the platform’s new point-of-sale (POS) system to charge customers in-store. The Ottawa-based e-commerce retailer announced today it was launching Shopify Payments to allow merchants to accept and manage payments with Visa, MasterCard, and American Express. At the same time, for merchants who also have brick-and-mortar stores, Shopify has brought out a new POS system. Complete with all the hardware trappings, it uses iPads as terminals and links directly to a merchant’s online store. These two new add-ons simplify transactions for merchants, Shopify says. With Shopify Payments, they don’t have to bother with creating an account on a third-party payment system, which has to be approved before any transactions can go through. 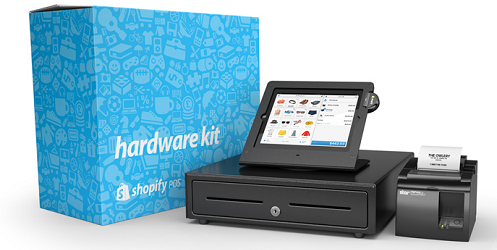 Shopify’s new hardware includes a credit card reader, cash drawer, iPad stand, and receipt printer. And by adding in a POS system that allows merchants to swipe credit cards while connecting them to their online stores, it also means merchants no longer have to worry about syncing their finances with their sales and inventory, said Louis Kearns, Shopify’s director of payments. Shopify Payments will allow merchants to track payments in real-time, so they can follow their payment balances and get emails when money reaches their bank accounts. Payments also match up with customer orders, so merchants can see exactly how much they’ve been paid in their transactions. And when customers dispute a charge in a chargeback, merchants can get automatic responses from Shopify on the details of the order, shipping, and customer details. Merchants who are just rolling out stores on Shopify will automatically have access to Shopify Payments, so they can start selling right away. For merchants who already have a Shopify plan, the service doesn’t cost anything extra. Merchants on Shopify’s Starter plan will pay 2.9 per cent, plus 30 cents per transaction, and merchants using the Unlimited plan pay 2.25 per cent plus 30 cents per transaction. There are no additional fees for accepting American Express or international credit cards. To use the Shopify POS, merchants will pay about rates of about 2.1 per cent, plus 30 cents per transaction on all credit cards. Earlier this month, Shopify acquired Jet Cooper, a design and user experience agency in Toronto. The e-commerce retailer serves more than 60,000 online retailers, including Tesla Motors, Amnesty International, and General Electric.